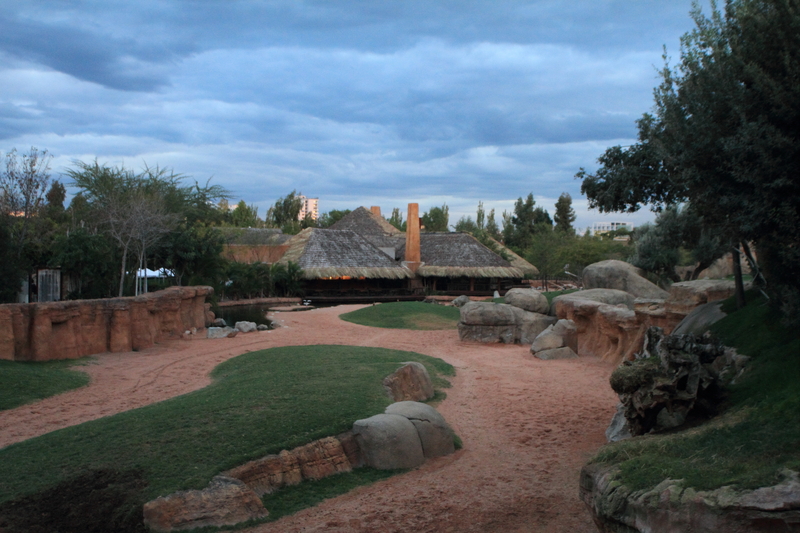 This week I decided to go to the Bioparc on Tuesday evening as I know that at this time of day the parc is very different to the mornings. During the winter it closes at 6.00pm so I arrived around 4.30pm to find that the place was virtually deserted, its turned cold suddenly and was late so I guess people decided to stay away. More chance of me seeing something unusual I thought. 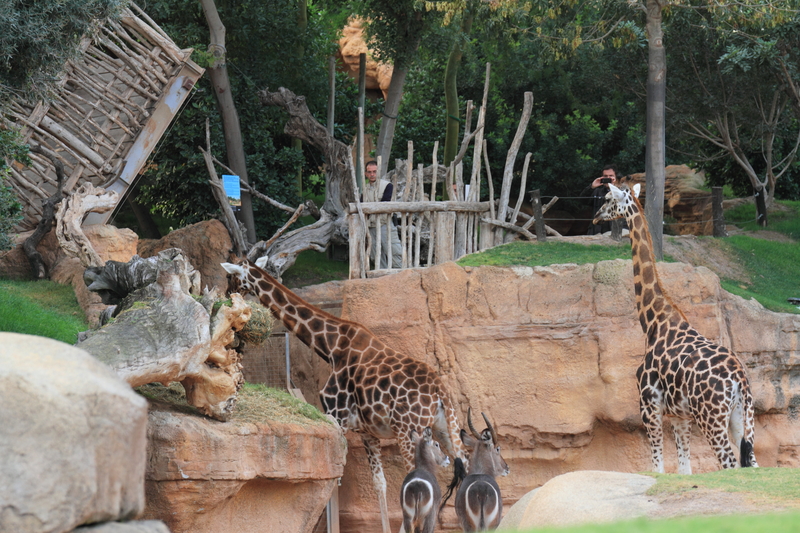 The first thing I noticed was that the “Savannah”, normally the centrepiece of all that happens in the Bioparc was emptying. 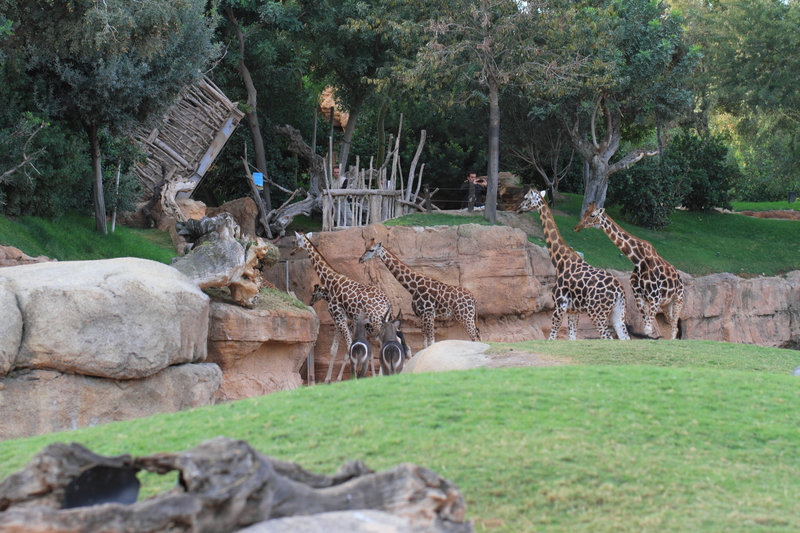 On the far side the keepers had raised the bridge to allow the Giraffes access to their overnight quarters, without prompting they duly filed out one after another. A quick look around the other side revealed that the Rhino’s were also already in their overnight pens. and I began to wonder if I had left it too late. I was not to be disappointed. 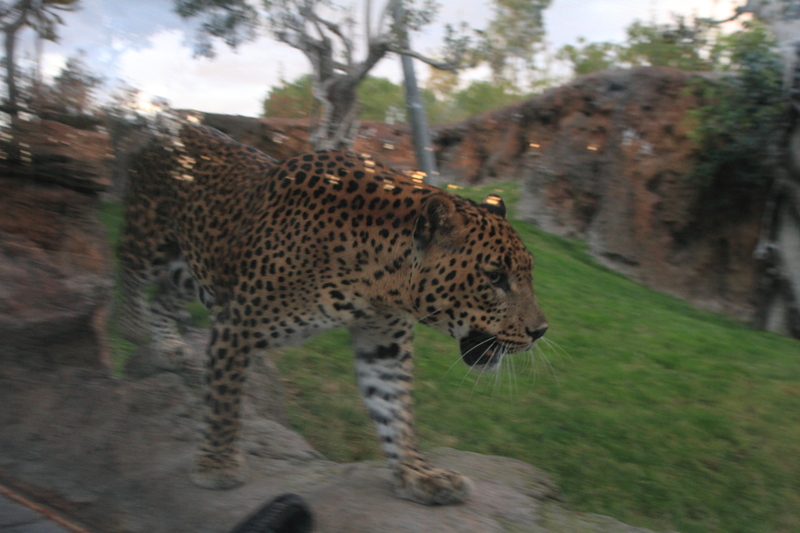 My favourite animal in the whole of the Bioparc is the Leopard (Panthera pardus), normally dormant during the day, this is the time when he comes alive. 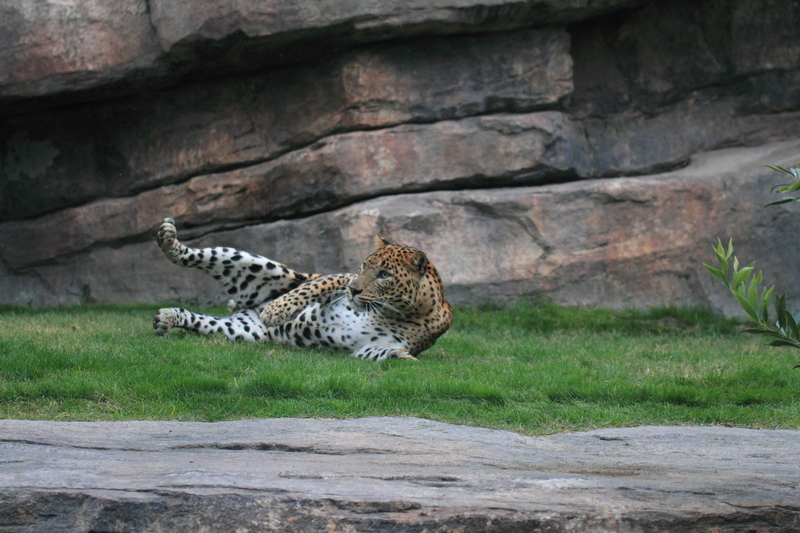 There is a black one and a spotted one together in the enclosure which has running water, some trees, grass and rocks within. Wire caging covers the top of the enclosure and several large glass viewing panes are along one side. Apparently they belong to the same species, it is just colour pigmentation that makes one black and one spotted. Being quite late and dark it was difficult to get really good quality photos of the two Leopards, particularly the black one but the ones I did get were quite amazing. I stopped at the largest glass panel which runs from the floor up to about 6ft. The black panther was sitting quietly in the shadows but the spotted one began pacing up and down, rolled nicely for the camera and posed sitting on the rock before coming to say hello! I hope I’ve been able to capture this in the photos as frequently there was literally nothing between me and the animal but a pane of glass. He was aware of my presence and once or twice stopped to look but continually paced up and down in front of the window. It is an indescribable feeling to be that close to such an animal and I desperately wanted to reach through and stroke it, but of course there would be no hand left if I had done! At that distance you can almost feel the immense power in its back and legs. 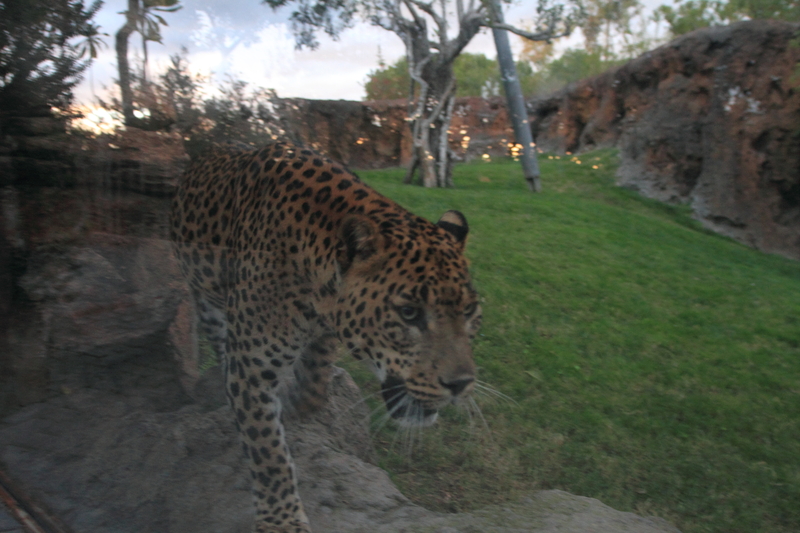 When the Bioparc first opened he tried to paw my feet through the glass on one occasion, but by now he had obviously learned. I sat for some considerable time mesmerised by the beast, hardly noticing the little boy standing next to me looking up at an animal that was bigger than he. 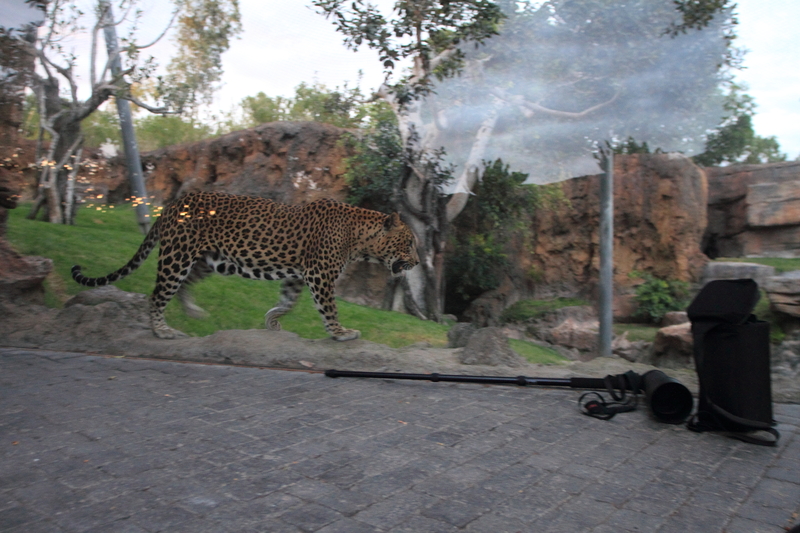 I moved to one side to allow the mum to take photos of her son standing alongside the Leopard before resuming my place. As I have said, the quality of the photographs is not as good as I would like but it was almost dark, no flash and I was shooting through glass. I was so engrossed in the Leopard that I forgot about the time until the announcement to close the parc came over the tanoy. I didn’t have time to see what the rest of the animals were up to, but there’s always another day. On the way out I managed to get off a shot of the restaurant and cafeteria overlooking the “Savannah” with everyone gone.